Full of surprising shows and audience favourites, a new year can only mean one thing—the High Performance Rodeo is back and ready to take you on one wild ride. With a diverse and provocative lineup, there’s something for everyone on the schedule of Calgary’s international festival of the arts. Produced by One Yellow Rabbit and presented in co-operation with many of Calgary’s major arts organizations including Theatre Calgary, Alberta Theatre Projects, Swallow-a-Bicycle, Decidedly Jazz Danceworks, and Lunchbox Theatre, this festival is always a cultural highlight. It’s one of the best ways to resist the urge to hibernate post-holiday! A world premiere from One Yellow Rabbit, this all-new journey takes you behind the scenes of self-help gurus and the trials of ageing with—or without—grace. Starring John Murrell, don’t miss this satirical comedy about growing older. Lunch hour has never been so good! For three Wednesdays in January, grab your food and head to Cathedral Church of the Redeemer to enjoy performances from Bessie Wapp & Little Miss Higgens, Allison Lynch, and One Voice Chorus. Returning to Calgary by popular demand, Better Get Hit in Your Soul gives audiences an ear and eye into the music of one of the most important figures in 20th-century American music, Charles Mingus. Exploring the wild short life of this virtuoso bass player, accomplished pianist, bandleader, and composer, Decidedly Jazz Danceworks premiered the piece in 2013 to rave reviews. Always a Rodeo favourite, see six of Calgary’s most audacious indie theatre companies take on the dare to create an original 10-minute play in 24 hours. The High Performance Rodeo headliner, Shane Koyczan is often regarded as Canada’s best known spoken word poet. Powerfully engaging and authentic in attitude, the show features special guest, local artist Kris Demeanor. Kids in the Hall’s own lounge lizard Buddy Cole makes a return to the limelight in an evening of humorous monologues. One of his most beloved characters, Scott Thompson has been creating and performing monologues as Buddy for over 30 years and this is your chance to see him live. 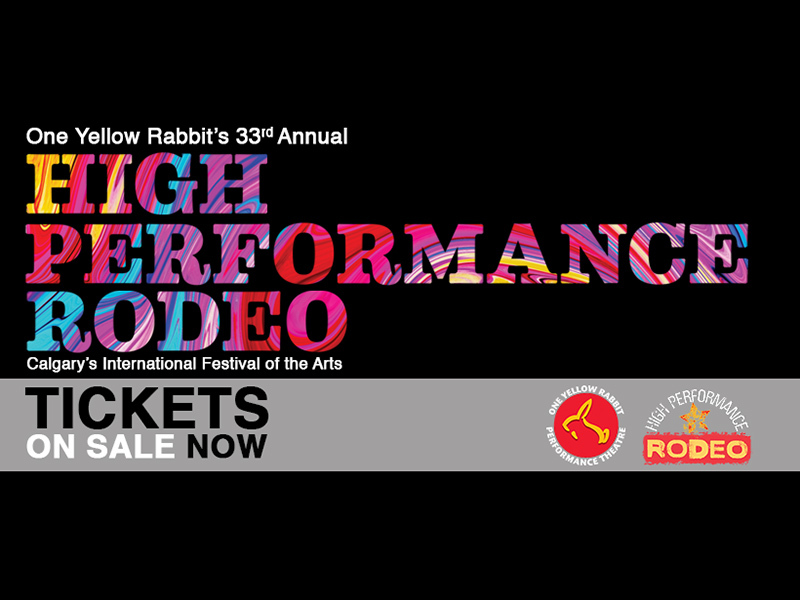 One Yellow Rabbit’s 33nd Annual High Performance Rodeo runs January 9 to 27, 2019. Head to hprodeo.ca for a full list of events, tickets, and to download a digital festival guide. On a budget? There are always good deals to be found at the Rodeo and this year is no exception. With the return of $15 Wednesdays, you can scoop up the best seats in the house to some of the hottest shows for just $15. There are even free and pay-what-you-can events for you to check out.